Armed Forces Name Tapes | Military Names Military Name Tapes & Rank Insignia. Leather Flight Badges for all Branches of Service. Add some flair to your uniform with our armed forces name plates. 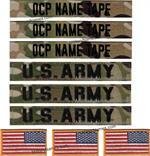 We provide only the best in military and Army name tapes. Shop with us and you’ll be confident you’re receiving quality products from a knowledgeable business. 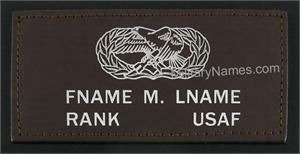 For more than 12 years, we’ve been providing name tapes to all branches of the armed forces, including law enforcement name plates. Here at Military Names, we are dedicated to your satisfaction. As a member of the armed forces, you deserve excellent customer service and high quality merchandise at an affordable price. Already shipping out? No problem! We provide overseas delivery through U.S. Postal Service. Your honorable duty should be recognized no matter where you are based. Our mission is to ensure you get the products you need even after you’ve received your orders. 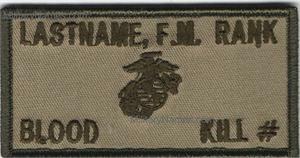 When ordering name tapes don't forget we also carry dog tags, as well as ranks insignia and unit patches. We’ll stamp your dog tags to your branch of service specifications so you can start wearing them as soon as you receive them. Contact us to find out more about our armed forces name tapes. We proudly serve customers worldwide. 1 inch Black Fabric Strip with Embroidered thread color of your choice. With the Male side of Hook Fastener Sewn ion the Back.